While much fuss was made about Kevin Anderson’s run in the US Open, South Africa already has a champion in the event. 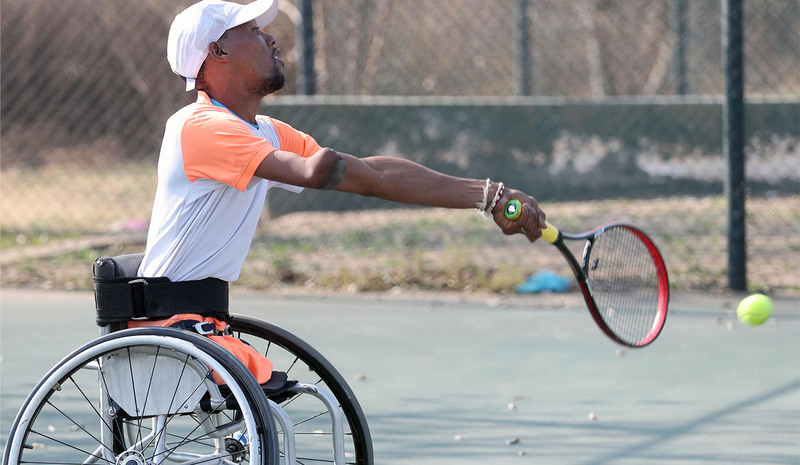 Lucas Sithole is a wheelchair tennis player – a sport that is thriving in the country, despite serious challenges and a fraction of the coverage the mainstream sports get. By ANTOINETTE MULLER. Whenever Andy Murray is quizzed about certain feats and journalists ignore the women before him who achieved the same, he always adds a deadpan: “first male…” prefix to the unsuspecting scribe’s question. Last week, as Kevin Anderson was building up to making history, South Africa could have done with an Andy Murray of their own. Take nothing away from the lanky South African star, his achievement was phenomenal in context. He’s battled injury and setbacks and while beating the world number one was too much of an ask, Anderson has made a huge impact on the sport. But South Africa already has a US Open champion. His name is Lucas Sithole and he – and his fellow tennis stars – are having an impact in their own right. The only difference is Sithole plays his tennis from a wheelchair. In 2013, he won the US Open, beating the then number one, David Wagner, 3-6, 6-4, 6-4. It was Sithole’s first Grand Slam final and he did not miss a beat. Yet, in the lead-up to Anderson’s final, few would have even known that Sithole existed, despite the fact that he was greeted by a large crowd upon returning home from that triumph. “It sometimes feels like wheelchair tennis is forgotten,” Anthony Moruthane, PR Manager Wheelchair Tennis South Africa, tells Daily Maverick. And yet, when looking at the numbers and the rankings, it should be something that is widely celebrated. While Sithole and Kgothatso “KG” Montjane are perhaps the most well-known wheelchair tennis players in South Africa, they certainly aren’t the only ones. The country boasts five men and five women ranked in the senior top 100 in the world. There are a further eight boys and five girls in the top junior rankings – two boys and two girls are in the world top 20. In the quads category – where players can hold rackets taped to the hand and use electric-powered wheelchairs – South Africa has a further five players in the top 100, including world number four, Sithole. Contrast that with the ATP and WTA rankings where South Africa has a solitary player – Anderson – in the top 100 and it’s startling how little fuss is made about the country’s wheelchair achievers. But this narrative is hardly new. “Minor sports” – including disabled sports and women’s sport – have to battle for the back pages and Moruthane says that while coverage has improved, it still often gets bumped for the big three sports. But the sport’s success – and its holistic approach to development – is extraordinary. That Sithole achieved such lofty heights just seven years after picking up a racket is testament to that. Wheelchair tennis was only introduced in South Africa in 2002, and has blossomed into a well-oiled high-performance machine. On a budget of just R9-million a year – largely through a sponsorship from Airports Company of South Africa – the programme straddles all nine provinces of the country with a keen focus on rural areas. There’s a monthly talent scouting session at the federation’s regional centres and schools, of which there are more than 60 around the country. Regional and national championships – all paid for by the federation – help take talent identification a step further. In just a few short years, wheelchair tennis has achieved immeasurable success and changed dozens of lives. Wheelchairs and transport are all sponsored in order to ensure the players only need to focus on playing. But perhaps the best thing about wheelchair tennis in South Africa is how representative the sport is of South Africa’s demographics. The “transformation” buzzword gets thrown around to score cheap political points far too easily these days, but a brief glance at the names representing South Africa paints a picture of an overwhelmingly inclusive sport, despite serious barriers to entry. Of the 500 registered and active players in the country, 97% are black. This has not happened by accident. “We made it our mission to focus on the rural areas,” Moruthane says. “We wanted to empower people in the deep rural areas who are forgotten and who feel useless. We wanted to show them that they can do something with their lives,” he adds. Many of the players come from extremely disadvantaged backgrounds, but tennis offers a way out and potential life-changing experiences, including the opportunity to compete internationally and travel the world. “Many of our players do not even have parents. So we become parents and are a real family,” Moruthane adds. Equally important is that the players who go on to achieve from those rural areas change the misconceptions around disabilities. “You can’t look at Lucas and feel sorry for him. He’s a businessman and a successful athlete,” Moruthane says.